Recently, Hog Roast Chigwell team were hired for an event hosted by Florian. The event was held at Tamesis Sailing Club in Teddington. The event was a split into two parts which included a delicious afternoon buffet and an evening service. The buffet was to be served at 3:30 pm while the evening service was to commence at 6:30 pm. The afternoon buffet was a cold buffet which was to be served to thirty people. 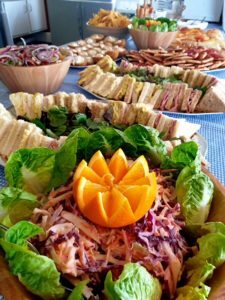 The buffet included a selection of flavours of freshly cut sandwiches which had been prepared fresh onsite. The buffet also offered a selection of snacks and sides including scotch eggs, vegetarian friendly quiches, cocktail sausages, cheese sticks and sausage rolls. In addition, cold pizza slices and tacos with guacamole were served as the main pieces on the buffet alongside a selection of sauces and homemade coleslaw. The client provided their own crockery and cutlery, however, the Hog Roast Chigwell team took care of the buffet handling and washing up of the cutlery and crockery. The evening service featured the Southern Slow Roast menu for sixty people and was again served on the client’s crockery and cutlery which the team cleaned thoroughly again after the second service. The menu featured three fantastic main meats including Texan 24 hour beef brisket, fall off the bone Louisiana sticky pork ribs and Cajun spiced whole roast chickens. As an alternative, a vegetarian option of grilled vegetable and halloumi skewers were served with pitta breads and a tzatziki dip. Alongside all of these main dishes, sides of homemade coleslaw, a Greek salad, corn cobettes, sweet potato wedges and handcrafted macaroni and cheese. An addition of chips were added at the request of the client, Florian, and the menu was served in a casual buffet style but with a luxury twist. The service was led by the Hog Roast Chigwell team’s Catering Manager Jean-Paul who prepared and cooked all of the food on site which ensured that it tasted fantastically fresh. The team always use fresh and locally sourced ingredients to ensure that all of the food tastes fantastic and the clients find no fault with the food. Christmas Hog Roast Stanford-le-Hope Planning!